I am finally off across the pond. I was invited by Skin Deep magazine to attend the 2016 Tattoo Jam at Doncaster Racecourse in Doncaster, England. I am very excited about this and have been planning the trip for several months now. 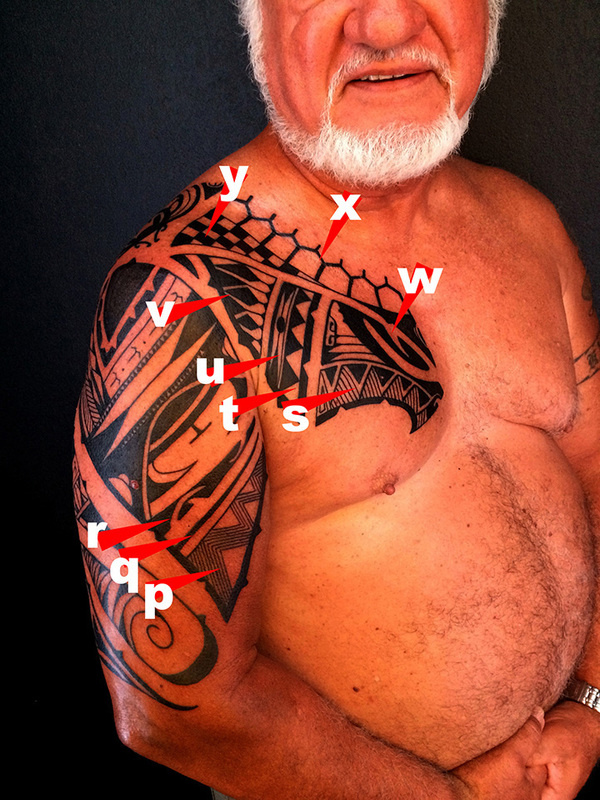 I will also be giving a seminar on Polynesian tattoo on Friday, August 5 at 2:00pm at the venue, which is free to attend. I still have some open spaces if anyone is interested in having work done. 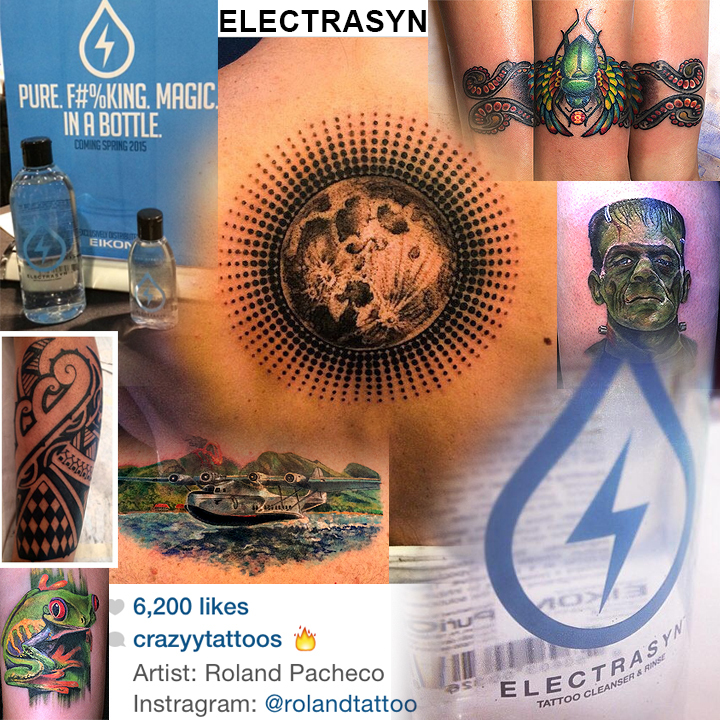 Please let me know via email, supersonik@earthlink.net or social media, IG/twitter: rolandtattoo. I leave tomorrow and will spend a few days in Ireland before heading out to Doncaster, so this will be somewhat of a much needed vacation, as well. Here is a discount code for tickets to the show, for those interested. This client wanted a piece that reflected his faith and spirituality, his desire to become a pilot in the military and his love of family and of the sea, with the overall intention of balance. I chose to convey it all in symmetry (for balance) and again, utilized the nesting of a tattoo within the body of a tattoo. The focal point is the large manu (bird) symbol that splits the piece in half but also acts as the crown of the head of the mata hoata that comprises a majority of the upper portion of the piece. On each wing I placed a row of ani ata which symbolize his ancestors protecting him as he moves forward. The circular mata shapes upper part feature four eyes; one set looking up, the other down. There are eyes on each cheek as well. This is a highly aware, protective piece. This entire upper part is nested into a lower half that is itself another mata, albeit only the eyes are present. This is because the upper part is a tattoo on the head of the lower entity, speaking of divine connection and spirituality as it is, being born of mindfulness. 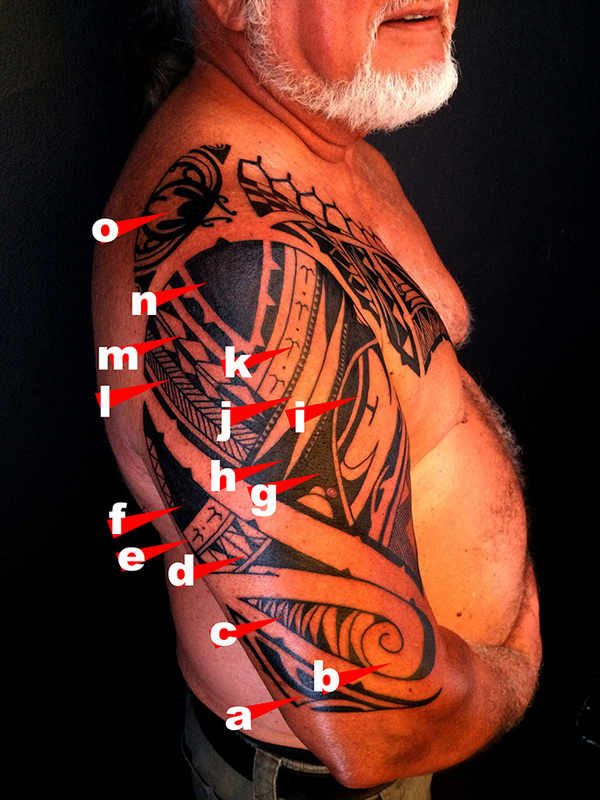 The lower portion shows family and protection, with the niho that form its upper mouth and growth and strength in its lower jaw, with the koru and ka’ake. There are also twin fish hooks on either side of the tiki that show his love of the sea and visually, act as ears. I had a ton of fun constructing this piece and I hope that you enjoyed the read! a) koru- unfurling fern head: growth, breath, life. b) ka’ake- upraised arm: strength, also supports the growth of the koru. c) niho- tooth: this line of niho represents family and is protective to keep danger at bay. d) mata- eye: these are the eyes of the entire entity, looking out for danger. e) mata- eye: these are the eye of the upper portion, which is a tattoo worn by the entity to protect the entire tattoo. f) manu- bird: this speaks of this faith, his desire to be a pilot and acts a symbol of guidance as he moves forward in life. g) ani ata- the horizon: these symbols represent his ancestors as the help to guide him in life. h) matau- fish hook: this speaks of his love of the sea. There’s a first time for everything! I was asked to do a Polynesian leg piece in water color style, something that I had never even considered before and this is how it turned out. The piece is in memory of her grandmother and is an homage to when she paddled out and spread her grandmothers ashes in the sea. The overall piece repeats the story twice: on a somewhat gloomy day she and her family paddled out into the bay as the sun was setting and it began to rain. When they stopped to spread her ashes the rain ceased and the sun broke through the clouds. Then a whale breached right next to them as the last of her grandmothers ashes fell into the sea. The symbols in the tattoo represent her grandmother, protection, life, family and the whale. I wanted the colors to mimic the sun setting on the darkened ocean. 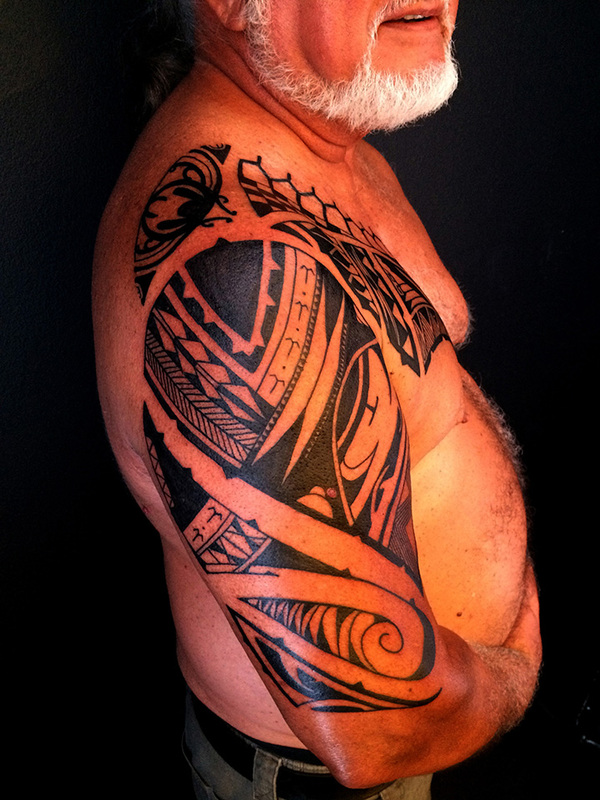 Done in modern Marquesan/Tahitian, Maori style. Some of the stencil is still visible on the top part. Super stoked with how it all turned out. Symbols also follow the Fibonacci sequence in terms of usage. a) koru – unfurling fern head, this symbolizes growth and life as she moves forward. b) kohola – whale, this symbolizes a venerated ancestor as well as the spirit of the sea. c) etua – venerated ancestor, this symbolizes her grandmother. d) lauhala – pandanus weave, this woven symbol represents her ties to her grandmother and overall family unity. e) niho – tooth, this protects the intention of the tattoo itself. f) u’uhe – piece of turtle shell, this is to protect the wearer. g) mata – eye, this is the eye of the piece and is meant to look out for danger and to protect. I am very proud to have been able to contribute to the launch of this phenomenal new product from Eikon Device. This is by far the most effective, cutting edge anti pathogen product out there. I only use products that I truly believe in and this is one of them. Not only is it exceptional at killing nasty pathogens but it also calms the skin and keeps redness and swelling to a minimum. I am able to tattoo longer with less irritation to the clients skin. Freshly finished tattoos look healed. No harsh chemicals and a neutral ph. 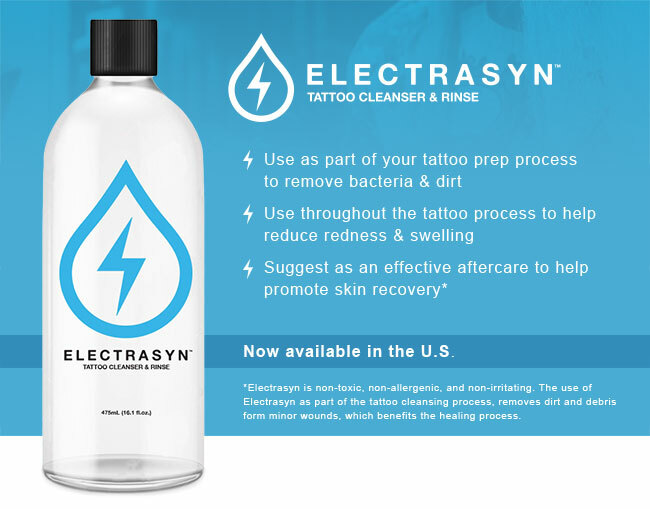 Electrasyn is a game changer in the tattoo industry! Thank you for your time. Peace!